Child care arrangements refer to the care of a child by someone other than a parent, including daycare, nursery or preschool, Aboriginal Head Start, before or after school programs and care by a relative or other caregiver. Source: CICH graphic created using data adapted from Statistics Canada. 2006 Aboriginal Children`s Survey. http://www.statcan.gc.ca/pub/89-634-x/89-634-x2008001-eng.pdf -accessed August 27, 2017. 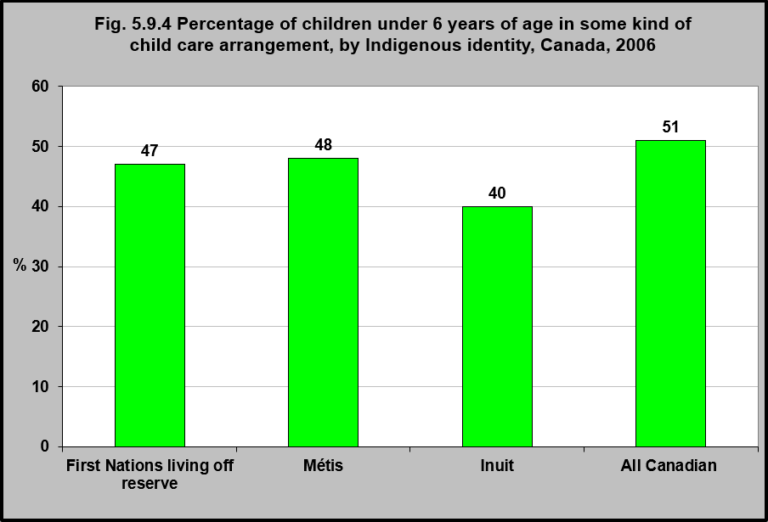 In 2006, 47% of First Nations children under 6 years of age living off reserve were in some kind of child care arrangement. This compares to 51% of all Canadian children under 6 years of age being in some kind of child care arrangement (excluding those living on-reserve and those living in the territories).